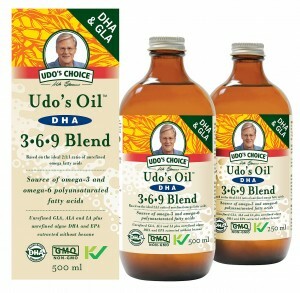 Udo’s DHA Oil Blend is simply Udo’s 3-6-9 Oil Blend with additional DHA – one of the Omega Fatty Acids commonly found in seafood. This is a vegetarian formulation. Did you know that the Omega 3 fatty acid DHA –which people consume fish oil for – actually has its origins in the algae that fish eat? Udo’s DHA 3•6•9 Oil Blend® is an excellent vegetarian source of algae-derived DHA (Docosahexaenoic Acid). 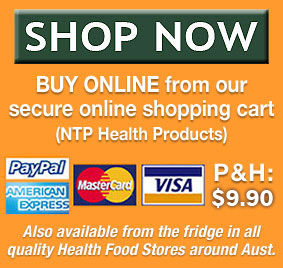 So now there’s no need to kill fish to supplement your diet with DHA! The DHA in Udo’s DHA Oil Blend is made from cultivated, unrefined algae, not fish, so it is naturally free of iodine, heavy metals and other ocean pollutants. Made without extensive filtration, molecular distillation and other types of industrial processing, it is the only unrefined algae-sourced DHA on the market. This oil combines DHA-rich algae with a special formulation of natural, unrefined oils from fresh, certified organic flax, sunflower, sesame and evening primrose seeds as well as oils from coconut, rice and bran. No chemicals or bleaches are used on it at all. This means that the DHA oil contains a full spectrum of phospholipids like phosphatidyl choline and serine. It may also contain a small amount of harmless sediment due to being unrefined. What kind of algae is it? The algae are marine algae originating from the ocean, BUT cultivated in fresh water fermentation tanks in an indoor facility. This way contamination risks are fully controlled, so there are no PCB’s or toxins, commonly associated with regular ocean water. Because Udo’s DHA oil is made from cultivated, unrefined algae and not fish, it is completely free of mercury and other ocean-borne contaminants. As a renewable resource, tank-grown unrefined algae has no detrimental impact on worldwide fisheries. The algae used in Udo’s DHA Oil Blend® do not perform photosynthesis. They are single celled algae and are unrelated to spirulina, chlorella, or blue-green algae. They are fed glucose, oxygen, and nitrogen in order to thrive and grow; it is through this growth and fermentation that the algae produce DHA. Specifically, the DHA product used in Udo’s DHA Oil Blend is called “life’sDHA”, a vegetarian source of DHA, derived from algae by Martek Biosciences Corp. (NASDAQ:MATK). The amazing DHA-producing algae are grown in a controlled, patented process that eliminates any risk of environmental contamination. Added to Udo’s Choice 3-6-9 Oil Blend, the No. 1-selling combination oil in the market, life’sDHA™ provides all the benefits of fish-based DHA with none of the disadvantages. Udo’s Choice bottling plant receives the oil in its unrefined and undeodorised state – and in this state it contains extra nutrients. (Other companies use the oil after it has been refined and deodorized, destroying its nutritional value). The extraction of DHA oil from the algae is done at a GMP and Kosher certified facility without the use of any GMO products. The extraction process does NOT use hexane to remove the oil from the algae (as with other oil extraction facilties) to get the highest quality DHA without further refining – such as would be necessary with hexane. Once the algae have matured, fermented and produced DNA, they are put on low heat in a rotary evaporator, blasted with nitrogen gas for a few hours, and then tested for solvent residue, fatty acid content, microbial levels, heavy metal and pesticide levels, and a rancidity scan to ensure it is a quality and clean product. is packaged in environmentally friendly dark amber glass and boxed to protect from light. Check with your GP if taking medication. For optimal freshness keep refrigerated at all times. NOT a cooking oil – do not heat or use for frying as this will damage the delicate fatty acids. Once opened, consume within eight (8) weeks. Can be frozen to prolong shelf life. (Record freezing date on bottle. Oil shrinks when frozen; the glass bottle will not break). Can be frozen for up to 4 months after the declared “Best Before” date. Occasionally a cloudy layer may form – this is natural, just shake gently before use.